Coach Morris Buttermaker: The first inside pitch you get, lean into it and let it hit you. Coach Morris Buttermaker: You want to win the game, don't you? Rudi Stein: Well, I don't want to get hurt. Coach Morris Buttermaker: Alright. Alright. But, you want to win the game. Who better to leave your children's care than in the hands of an alcoholic? LOL, I know I stole that line from I love the 70's, but I just thought it was so true and that was my exact thought from the first minute I started watching The Bad News Bears. 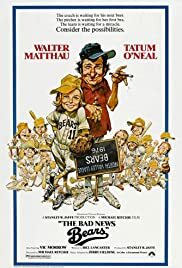 Now to the movie, The Bad News Bears is one of the funniest movies I have seen in a long time, I almost died laughing throughout the whole movie. I obviously heard about this movie from the show I love the 70's on VH1, way before the remake with Billy Bob Thorton. It always slipped my mind though when I wanted to rent it, but finally I remembered and I am so glad that I got the chance to see it, because this is one of the best comedies to come out of the 70's. Buttermaker is a has been baseball player and now an alcoholic, he is given the job of a little league coach for the Bears since no other fathers are taking the job. But he's definitely taken back when he finds out that the team he is coaching are kids who are, well, I guess you could say "lacking" in the department of knowing how to play baseball. But he just wants to get paid and get the job over with, but when their first game comes along, the kids get creamed 26-0, Buttermaker is pressured to drop the team out of the league, but instead teaches the kids how to play and recruits a couple of new kids, a girl who's mother he used to date, and a rebel without a cause. The kids get better in each game, but it's a matter of Buttermaker getting his priorities straight when he lets the game get the worst of him... and he's an alcoholic! The Bad News Bears is just so funny, Walter Matthau was just too perfect for this role as Buttermaker, he was so believable. I think my favorite Bear was Tanner, because the role could have been over done, but the kid did it just right, not to mention his last line of the film is just classic and fit the movie just right. I loved how the film wasn't your traditional your favorite team is always going to be out of no where champions, this was an awesome comedy that anyone would just fall in love with.